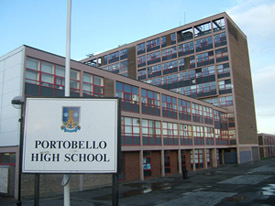 Portobello High School has a strong tradition of providing a high quality of education for all of our pupils. We strive to be a caring and inclusive school which promotes the highest standards of attainment and achievement, through high quality learning and teaching and opportunities within and out with the classroom. We work to develop young people as successful learners, confident individuals, effective contributors and responsible citizens. The school is a non-denominational six year comprehensive based in the east of Edinburgh. The current school role stands at over 1300. Our associated primary schools are Brunstane, Duddingston, Parsons Green, the Royal High and Towerbank. The school regularly receives requests for placements from out with the school catchment area. You need Adobe Acrobat Reader to view PDF files. Click here to download it if it is not installed on your computer.